There are several things which tell me autumn has arrived. I suddenly find that I am wearing my wellies more than previously, apples and pears have appeared in the fruit bowl again, I’m having porridge for breakfast and the wood burner comes alive. Then I notice that the leaves have turned orange and are falling from the trees, there’s a bit more rain than before and I really fancy a roast dinner. 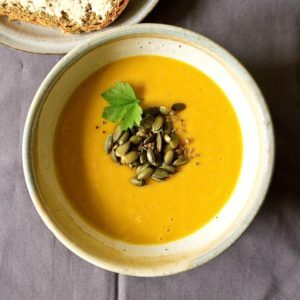 I wanted to share some of my favourite autumn recipes with you. I love cooking during autumn; there are so many colours around to enjoy, woody herbs get popped into pots and pans and there’s always the inevitable squash or pumpkin. 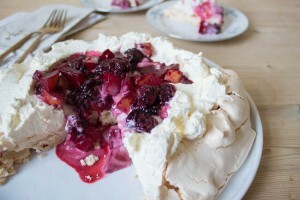 During the autumn season in my kitchen you’ll find fruit crumbles hot from the oven and smothered in thick cream, hearty pasta bakes which bubble over the edge of the dish, a batch of sloe gin on the go in the back of the cupboard and all manner of combinations of vegetables roasting in the oven. You can’t go wrong with an Autumn Vegetable Minestrone. Whichever vegetables you happen to have in your fridge can be added to this hearty soup which is so full of flavour. Adding both pasta and beans means this minestrone is really filling too. 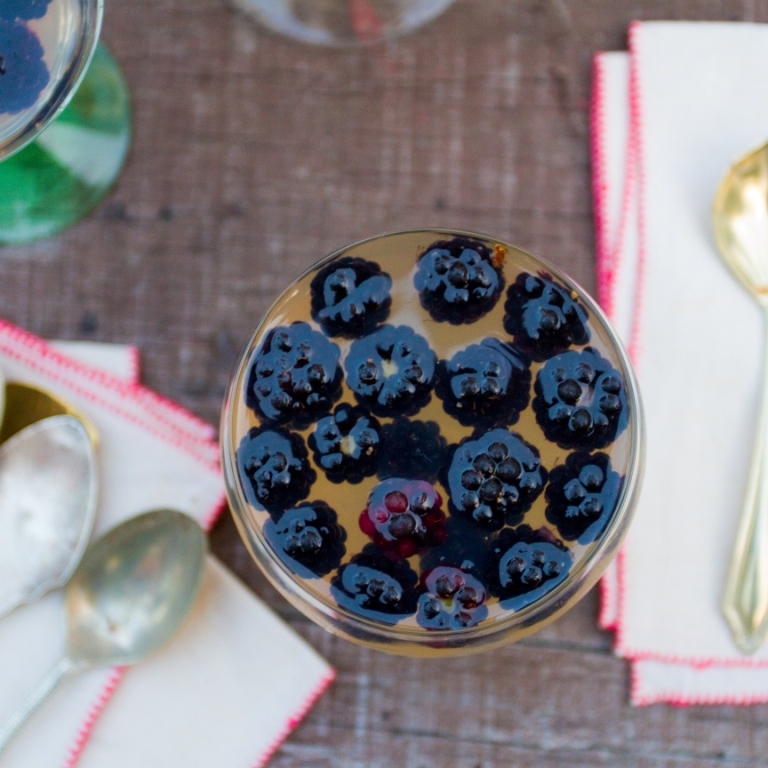 If you’ve not tried making Sloe Gin before then maybe this year is the year! You can wait until the first frost, or you can pick early and freeze the sloes at home before you start infusing those beautiful purple berries with gin and sugar. A glass of sloe gin by a roaring fire when your warming your feet up after a soggy walk; there’s nothing better. Staying in on a rainy day and getting something on the hob to blip away in the background is what my Proper Ragu is all about. The longer you cook it, the more intense the flavours become and it’s fantastic served with pasta, used for lasagne or other pasta bakes. It takes some time but it’s so worth it. Similar to the sloe gin above you can also try making some Quince Gin. It is a really beautiful colour once it’s done and doesn’t take as long to infused as sloe gin. A really delicate and fanitly tropical flavour there’s nothing quite like it and it means you can mix up my Lime, Thyme & Quince Gin Cocktail too! 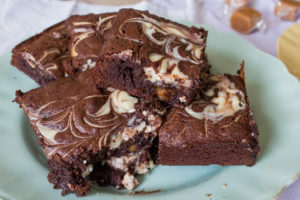 Autumn is such a great time for baking and I find myself craving some rather chocolatey things. My Chocolate Fudge Cheesecake Brownies are a real indulgence and perfect with a big cup of tea on a drizzly weekend. 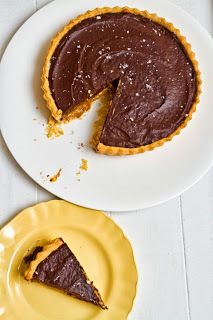 If you’re a fan of a Millionaire’s slice (I have to say, my biscuit/bake of choice whenever I’m out) then this Millionaire’s Tart is worth a try, complete with salted chocolate ganache. Venison comes into season in the autumn months and knobbly celeriac starts appearing at the markets. 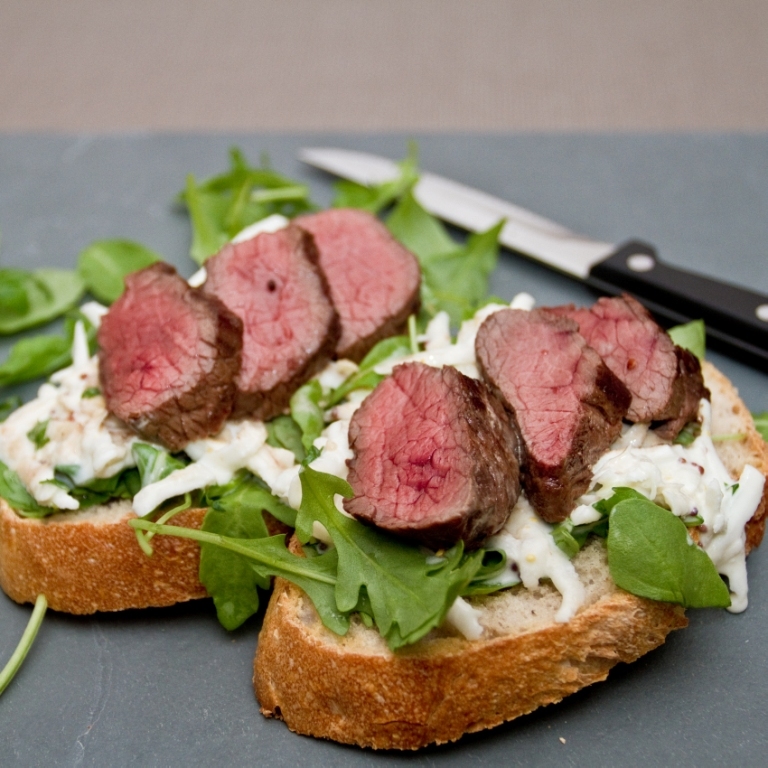 They are delicious as seasonal ingredients served together in Celeriac Remoulade, Venison and Sourdough Open Sandwiches. This year the blackberries have been out for a little while and there are still plenty more to pick. I absolutely love using wild blackberries, they have such a delicious sweet flavour which is far nicer than those you can buy in the supermarket. Whether you fancy trying a Blackberry and Pear Pavlova, my Baked Blackberry Cheesecake or some Blackberry and Perry Jelly get your hands on the berries fresh from the hedges. I don’t mind a butternut squash, but I’m not the biggest fan of them. Mixed with delicious spices and turned into a soup it results in something bright and vibrant which I do actually quite enjoy eating! 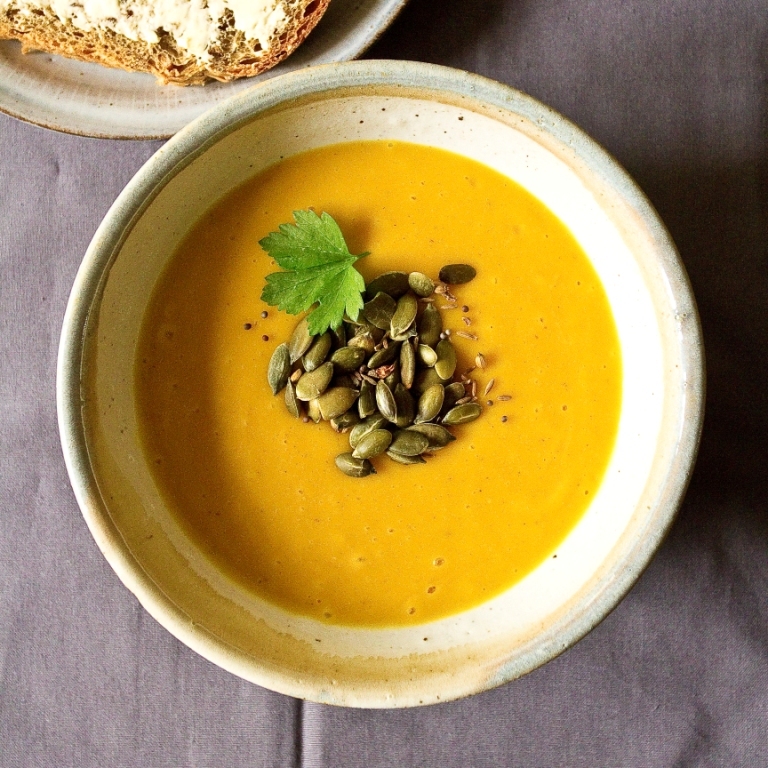 You can try my Curried Squash Soup with Toasted Spice Pumpkin Seeds and see for yourself! There are so many varieties of apples and pears I love finding new ones to try. I love baked apples, they are so simple to make and my recipe for Baked Apples with Salted Toffee Sauce is really straightforward and tastes so good! Poached Pears are also a favourite of mine and even better if you can find some elderberry wine to poach them in! This is the time of year to get out and forage for some wild ingredients, including blackberries! If you can find some cobnuts, also called wild hazelnuts, then you could have a go at making my Wild Hazelnut Brittle. Keep an eye out for elderberries too as they make fantastic Elderberry and Apple Turnovers. Lazy weekends spent at home with something cooking away in the oven making the house smell delicious, thick sounds of ‘plip’ and ‘plop’ from a simmering cast iron pan on the hob and steaming mugs of tea. Autumn I am glad to see you. Autumn is my favorite season — love the cooler weather (the cooler nights, in particular) , and the changing angle of the sunlight. And the food! Comfort food time. Some neat recipes here — thanks. wow what a great collection of mouthwatering autumn recipes! The sandwich looks outstanding! Autumn really couldn’t come soon enough over here in LA – but no. It’s going to be a high of 95 degrees today! UGH! You are very much descibing what is happening where I am and my changing cravings. that is an amazing assortment of fall recipes. Love autumn cooking – some fantastic recipes for those rainy stay at home days 🙂 Have a nice weekend ahead! All fine fall dishes, but the Sloe gin was of great interest to me. First, I love gin and secondly we have sloe (or Slån as we call it) growing in our forest. Now I’ve found another use for it. I’ll be picking some when we next go mushroom foraging. So many of the same aromas are wafting from my kitchen, even though it’s still really summer for us! Great flavors, Caroline! i LOVE autumn and the food it brings with it! your recipe selections make me feel all warm and fuzzy inside, as it should be! Autumn is a great foodie season, there are some great recipes here Caroline. Such a well written article Caroline. It has me remembering autumn in New Hampshire and how lovely it was. Here in Florida, the weather is still hot and I can only dream of a cool day and eating some of your delicious meals. 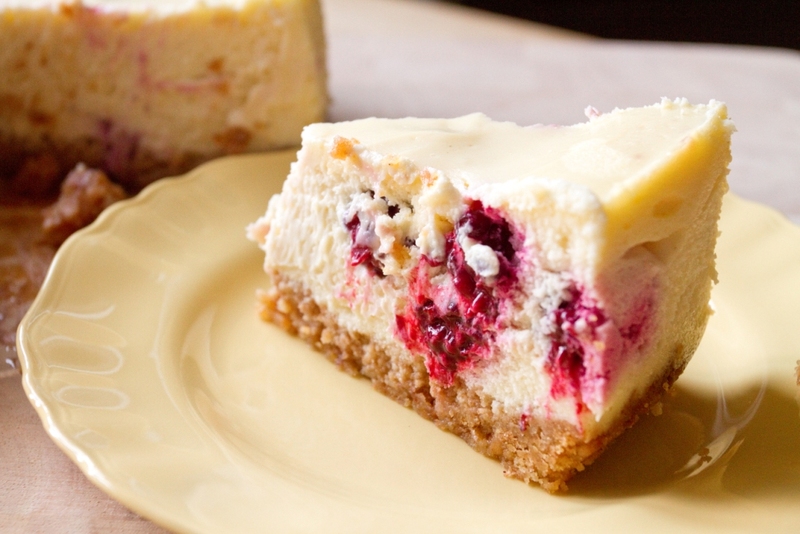 Relish your weekends in the kitchen during autumn. Thanks Karen! That’s really kind, hope the weather cools down for you soon!